I am rarely asked to knit for other people. It is even rarer that I know the recipient will actually use what I knit for them. And rarer than that I agree to do it. There've just been too many unused, donated, trashed, or ripped out (?) gifts for me to waste my time on that. This hat is the rare kind. 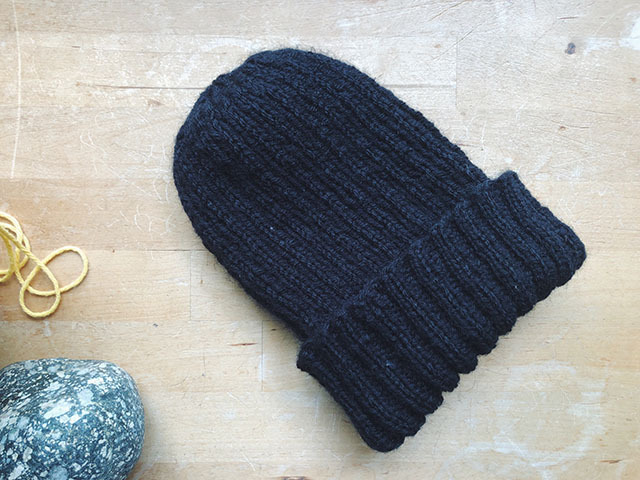 I knit one for my grandfather over ten years ago, but he never wore it because he liked to make a big fold in the brim of his hats when he walked in the winter and I think he felt like it was too small to do that comfortably. Also, you know how wool/acrylic blends can have little give and kind of inch their way up and off of your head? Of course, he never told me this, he just laid it on the shelf in his closet with his other hats because it still mattered to him that I made it for him. Later, my uncle inherited it. He found it perfect because he didn't roll his beanies and would never have remembered to hand wash a 100% wool hat. It had the perfect hipster fit for him. Last year, he asked if I would knit him another one in black. This is a knit-worthiness moment, guys. I planned to make it for him for Christmas. I was going to see him shortly afterward and bring it to him, but my gauge got weird and it looked like something Dumb Donald would be embarrassed to wear. I planned to immediately re-knit it but he was in and out of the hospital, soccer season started, my son graduated... Long story, short: I finally finished it... 6 months later, then mailed it... a few weeks later. I know. I'm the worst. 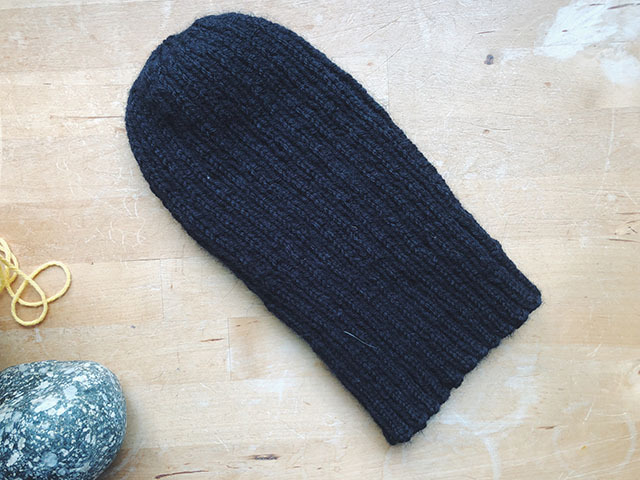 Details: I used the exact same pattern as before: Channah Koppel's Ribbed Watchman's Hat and the same yarn, Lion Brand Wool-Ease, since he liked the fit so much. This time I used worsted instead of two strands of sport held together. It felt wrong to buy an acrylic blend for a Christmas gift. I knew it would be most appreciated, but I still felt dirty when I left Joann. The whole thing knit up in about two days worth of knitting time. If I were to make another one for myself or a family member I actually lived with, I would go with real wool. But unless I'm here to offer to wash it for someone, it needs to be washer and dryer safe. Basic, inexpensive, and relaxing to work on, and very appreciated- not much more to say about it.